Egg Whites available for all omelets. 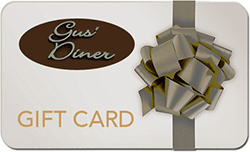 Gift cards available for $25, $50 and $100. © 2018 Gus' Diner. All Rights Reserved. Website by BiggerFish Marketing.